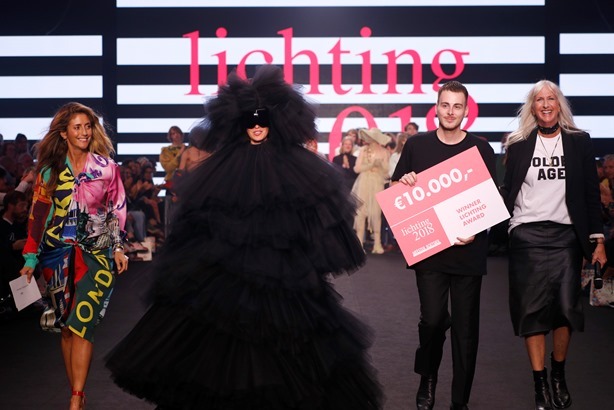 Tonight 25-year old AMFI student Ferry Schiffelers has won the Lichting 2018 award; THE award for upcoming Dutch design talent. An international panel of judges (with Alvise Bullo [Junior Research Manager Creative Talents LVMH Fashion Group], Christopher New [Course Leader BA Fashion Menswear and Fashion Programme Academic Quality Coordinator Central Saint Martins], Filep Motwary [Independent curator and author, photographer, fashion features editor Dapper Dan Magazine] and Gry Nissen [Creative Director]) chose Ferry Schiffelers out of 14 fashion graduates as the most promising new design talent in the Netherlands. Ferry won a money prince of €10.000,-, presented to him by the Meester Koetsier Foundation. “The moment this collection was presented to us we felt a wave of emotions and respect for classic fashion combined with innovation and the high professional level, which is quite unusual for ea designer of Ferry’s age. This certainly is a first step towards a big future in fashion”, the judges stated. Ferry’s collection titled Défilé De Deuil forms a combination of his fascination for funeral rituals and his love for women. Inspired by Victorian images of widows in the most richly decorated dresses he created a modern image of different generations of women showing strength and femininity. This translated into an all black collection with a variety of dresses in all shapes and sizes worn by a selection of five models, as diverse as possible (young, old, white, black). His designs were a woolen little black dress with cape and head wrap details. A floor sweeping silk dress worn by an older lady. A sequined and off shoulder dress sported with gloves (the model even carried a baby wrapped in black) that seemed fit for a night of clubbing. An extra long A-shaped and pleated number worn by a little girl. And an over the top, larger than life tulle dress (in which we easily could see singer SIA performing). A small but super strong, diverse, well tailored, original and cohesive collection. Getting dressed for a funeral will never be the same.